Q: When was your first encounter with Tiger&Bunny? Nishida: I think it was around the fall of 2009. Truth to be told, at that time I was quite busy working on some other scripts, so initially I refused to write for the show. But then the staff asked me to at least meet up with them, so I did. That was my first encounter with Tiger&Bunny. Q: What did you talk about during the meeting? 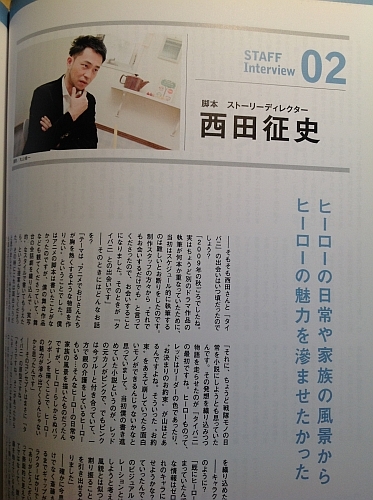 Nishida: They told me they want to create an anime featuring older men that would excite the viewers. Back then, I had yet to write a scenario for an anime series, but the staff told me they had seen my stage plays. They asked if I could write something similar to those, with realistic conversations. I thought it was really interesting, and people from the staff had, uh, interesting personalities as well (laughs) so I agreed to help. Q: You hit it off with them instantly, didn’t you? Nishida: Indeed. Also, at that time I really wanted to write a novel featuring sentai heroes from the perspective of their everyday lives. So I decided to run with this idea while writing for Tiger&Bunny. However, the hero genre has a lot of things that almost never change – for example, the red ranger is always the leader. So I thought it would be interesting to break those rules and create something new. In my novel, I wanted the pink ranger to be the red ranger’s ex-girlfriend who is now going out with the blue ranger. I also wanted to write about a hero who is taking care of his parents. I wanted to describe their everyday lives and family problems, because I think that by showing the parts of them that aren’t really heroic you can make them even more appealing. Q: And then you used this concept to write Tiger&Bunny? Nishida: That’s right. That’s why we have heroes like Blue Rose, who doesn’t want to be a hero, or Origami Cyclone, who doesn’t believe in himself. Many episodes feature heroes who are doing their job while worrying about their private lives. Q: How did you decide on the characters’ personalities? Nishida: When I joined the team, it was already decided that there should be eight main heroes. However, the staff hadn’t decided their personalities yet, so I could experiment with their lines and decide what personality traits to give them. That’s why I thought I should make them totally different from what my first impression was when I saw their visual designs. I focused on creating this gap between their looks and characters by giving them traits that don’t really fit with their designs. Q: Now that I think about it, even side characters like Saitou are like that. I think it really brings about their charm. Nishida: Why thank you! (laughs) I think there are certain aspects of personalities you can’t see from outside, as everyone has internal conflicts and things they worry about. That’s what I was always trying to keep in mind while working on the show. By focusing on the difference between the heroes’ work and personal lives, I attempted to show their hardships and conflicts from their own viewpoint in a realistic way. Q: Any times when you couldn’t help but grin while writing the script? Nishida: I had a moment like that when I was taking a bath and suddenly came up with the 2nd league heroes. (laughs) In a world where it’s normal for heroes to work, there have to be schools for them as well. I thought there should be something akin to a reserve army for the main heroes, that there should be a two league system. The lower one would be like a junior leauge in soccer, and the heroes could advance in status, or be demoted… I thought something like that would be interesting. Creating the 2nd league heroes was a really fun experience for me. What is their work, what kind of people they met everyday, what is their relation to the rest of the Sternbild’s world? It felt like all the answers came to me naturally. Q: So there are some things about them that still haven’t been shown in the series, right? Nishida: There are. But a small part of “The Rising” touches upon the 2nd league heroes’ lives, so I hope you’ll enjoy that bit. Q: Was there anything that made you grin in relation to the story? Nishida: The 14th episode, I suppose. The previous episode featured a huge climax of the 1st cour, and the 2nd one takes place 10 months later, so here and there you can see bits of Barnaby’s true character coming to the surface. I was grinning while writing the script, because I could finally add the gap I mentioned previously to Barnaby’s personality. Since his first episode, he was so focused on avenging his parents, he ended up hiding inside his shell, and had never shown his true colors to anyone. Barnaby was putting an enormous pressure on himself that was pinning him down, but then finally, in the 13th episode, he gets closer to Kotetsu. Then 10 months pass and something in Barnaby’s heart had to change, so I tried to show it as realistically as I could. Q: The two successful partners weren’t the only ones who changed during the course of 10 months. Nishida: Indeed. If you put yourself in the other heroes’ shoes, you can see the changes that happened in their hearts as well. That’s why we decided not to show what happened during that time, so the viewers themselves can put their imagination to work and come up with their own scenarios regarding what happened. Q: I think a part of what makes Tiger&Bunny so appealing is that it builds its large story on a solid foundation of the detailed depiction of the heroes’ everyday lives. Nishida: It makes me happy to hear you say that. When I’m writing my stories for stage plays and tv dramas, there are always so many things I want to include that something has to be cut out. So I create my stories from the little shards of my original concepts. I leave the rest to the viewers, so they can complete the story on their own and play around with different ideas. Tiger&Bunny is special in this regard, because it went beyond my expectations, with so many fans having fun with filling in the missing pieces. Q: I think it only confirms how much the fans love the series. Nishida: I like to think that too. Q: Let’s move to “The Rising”, then. What was your first concept? Nishida: In regards to Kotetsu and Barnaby’s story, I wanted to add some twists and turns that haven’t been shown in the main series yet. Kotetsu’s powers are declining and he might have to change his life soon, so the breakup of his partnership with Barnaby seemed inevitable. Q: It seems Kotetsu once more has to face the salaryman problems similar to the ones he experienced in the first episode, when his previous sponsor had to cut costs. Nishida: That’s true. The situation and his relationships have changed compared to the first episode, but the plot development is quite similar. It’s something I planned while keeping in mind the viewers who will start their adventure with Tiger&Bunny from the movie. Q: Tell us something about the new character, Ryan. Nishida: I wanted to see a salaryman (hero) who bravely stands up and fights when cornered. In the first episode of Tiger&Bunny, the heroes are rivals, but by the last episode, they’re already close friends. Each one of them stands out as a fully-fledged character, and you can feel the power of their newly-born solidarity. That’s why adding a new character is difficult, because if their personality isn’t interesting, it will stay hidden behind the already established heroes. Q: And we already have a character who uses that as his marketing strategy! Nishida: We needed a fiercely individualistic hero with enough personality to compete with other heroes, someone full of pride and an air of superiority. And, to make his personality really shine, I prepared a story that lets him go wild. Q: He sure looks like someone who can go wild (laughs)! This time you also worked as a story director, so could you tell us something about the acting in the movie? Nishida: I visited every recording while the TV series was still in works, and despite the fact that this time we met after quite a long break, I could still feel this natural solidarity between the actors. I decided to try something different this time and made each character include a bit of something special into their acting. I’d like the viewers to pay attention to how the voice actors expressed it in the movie. Q: What are the highlights of “The Rising”, then? Nishida: Of course, Kotetsu and Barnaby’s partnership and the sudden appearance of Ryan is the main focus of the movie, but I also made sure to feature the other heroes in it. I tried to reflect their feelings from the previous installments in the script, so I think the viewers will enjoy seeing their actions. I’d be really happy if the viewers thought about what it means to be a hero after watching the movie, based on what they saw of each character. Q: Well then, what are heroes to you? Nishida: I think the definition of a hero changes with time, so it’s hard to give a definite answer, but without a doubt it’s someone who helps those in need of help. It’s not the question of who we can call a hero – I believe the more important question is, for whom someone is a hero. Because when a person helps another, in that very moment, they turn into a true hero. Q: That’s the very foundation of the show, isn’t it. That everyone can be a hero. Nishida: I think that you can’t help people if you aren’t confident about yourself. But even people like that often rush to help someone when they see them struggling. I think Kotetsu is one of these people. So I guess for me, a true hero is someone like him.